In 1836 in East Texas, nine-year-old Cynthia Ann Parker was kidnapped by Comanches. She was raised by the tribe and eventually became the wife of a warrior. Twenty-four years after her capture, she was reclaimed by the U.S. cavalry and Texas Rangers and restored to her white family, to die in misery and obscurity. Cynthia Ann's story has been told and re-told over generations to become a foundational American tale. 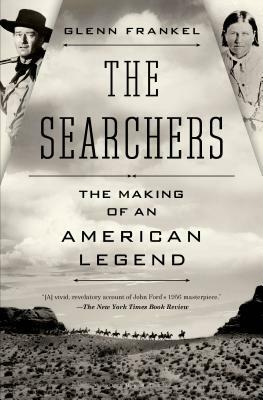 The myth gave rise to operas and one-act plays, and in the 1950s to a novel by Alan LeMay, which would be adapted into one of Hollywood's most legendary films, The Searchers, "The Biggest, Roughest, Toughest... and Most Beautiful Picture Ever Made!" directed by John Ford and starring John Wayne. Glenn Frankel, beginning in Hollywood and then returning to the origins of the story, creates a rich and nuanced anatomy of a timeless film and a quintessentially American myth. The dominant story that has emerged departs dramatically from documented history: it is of the inevitable triumph of white civilization, underpinned by anxiety about the sullying of white women by "savages." What makes John Ford's film so powerful, and so important, Frankel argues, is that it both upholds that myth and undermines it, baring the ambiguities surrounding race, sexuality, and violence in the settling of the West and the making of America. Glenn Frankel worked for nearly thirty years for the Washington Post, as a reporter, a foreign correspondent, and editor of the Washington Post Magazine. As Jerusalem bureau chief, he won the 1989 Pulitzer Prize for "sensitive and balanced reporting from Israel and the Middle East." His first book, Beyond the Promised Land: Jews and Arabs on the Hard Road to a New Israel won the National Jewish Book Award. His second, Rivonia's Children: Three Families and the Cost of Conscience in White South Africa was a finalist for South Africa's prestigious Alan Paton Award. Frankel has been an Alicia Patterson Journalism Fellow and a Hearst Visiting Professional in the Department of Communication at Stanford. He is currently the Director of the School of Journalism at the University of Texas at Austin. “For movie and history buffs, a must.” —MSN, "Pageturner"